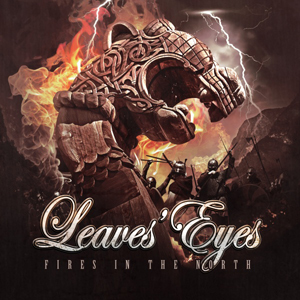 Out November 4th In The U.S.
LEAVES' EYES have unveiled details for their upcoming release, the Fires In The North EP, to be released October 7th in Europe and November 4th In the U.S.
After celebrating the biggest success of their career with King Of Kings, symphonic metal band LEAVES’ EYES parted ways with vocalist Liv Kristine. A suitable replacement was found in London-based Finn Elina Siirala, who now gives her official release debut with LEAVES’ EYES on the Fires In The North EP, after the “Edge Of Steel” video with her exceeded 400.000 videos on Youtube alone within only 3 months. Fires In The North is a stunning, majestic track – following the band’s tradition of only releasing high-class material. An acoustic version of the new hit song, plus 3 re-recorded tracks from King Of Kings (now incl. Elina on vocals) perfectly round off this EP release. The cover artwork was created by Stefan Heilemann. The album was produced by Alexander Krull at Mastersound Studio.